Alan Bonner and NW Racing team owner Noel Williamson. Alan Bonner’s devastated team have paid tribute to the well-liked Irish rider, who was killed in a crash at the Isle of Man TT on Wednesday. 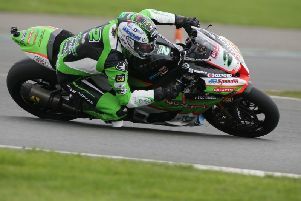 The 33-year-old came off during a Senior TT qualifying lap at the 33rd Milestone on the Mountain section, resulting in a full course red flag. The scheduled TT Zero race was later cancelled following the incident, which was the third fatal accident at the TT this year. NW Racing team owner Noel Williamson said Mr Bonner was a ‘special guy’ who was ‘more like a brother’. “On behalf of NW Racing I wish to off our sincere condolences to Gemma and the Bonner family. Alan was a talented rider and a genuine lad, and we are in shock at his passing,” he said. “In the short time that Alan has been racing with the team we have had great craic, pure and simple. Alan was a special guy to work with and he was more like a brother than a team rider.